News about a federal court ordering Apple to unlock the suspect’s iPhone has registered widely with the public: 75% say they have heard either a lot (39%) or a little (36%) about the situation. 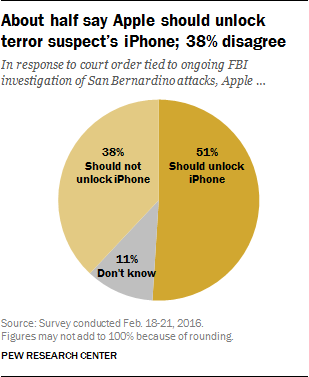 The latest national survey by Pew Research Center, conducted Feb. 18-21 among 1,002 adults, finds that almost identical shares of Republicans (56%) and Democrats (55%) say that Apple should unlock the San Bernardino suspect’s iPhone to aid the FBI’s ongoing investigation. By contrast, independents are divided: 45% say Apple should unlock the iPhone, while about as many (42%) say they should not unlock the phone to ensure the security of their other users’ information. However, independents who lean toward the Republican and Democratic parties – unlike those who identify as partisans – hold very different views. By a 58%-32% margin, independents who lean Republican say that Apple should unlock the iPhone. By contrast, 55% of Democratic leaners say Apple should not unlock the iPhone, while 34% say that they should. Across age groups, adults ages 18-29 are divided over what Apple should do: 47% say the company should unlock the iPhone, while about as many (43%) say it should not unlock the phone to ensure the privacy of its other users. Among adults age 30 and older, somewhat more say Apple should unlock rather than not unlock the San Bernardino suspect’s iPhone. By a 54%-27% margin, those 65 and older think Apple should unlock the phone; 18% do not offer a view. There are only modest differences in views across levels of educational attainment over whether Apple should unlock the iPhone. Those who have heard a lot about the dispute (39% of the public) hold similar views as those who have heard less about it. About half of both groups say Apple should unlock the iPhone to aid the ongoing FBI investigation, while somewhat fewer say they should not unlock the phone to ensure the security of other users’ information. Smartphone owners are more likely than those who do not own a smartphone to say Apple should not unlock the San Bernardino iPhone. Half of those who own a smartphone (50%) say Apple should unlock the iPhone, compared with 41% who say they should not unlock the phone. 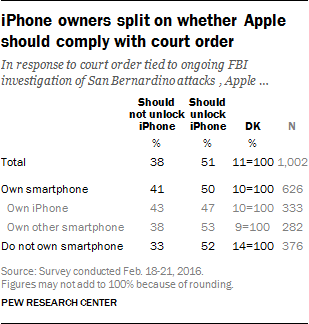 Among those who do not own a smartphone, 52% say Apple should unlock the San Bernardino iPhone, compared with just 33% who say Apple should not do this. Among those who personally own an iPhone, views are about evenly divided: 47% say Apple should comply with the FBI demand to unlock the phone, while 43% say they should not do this out of concern it could compromise the security of other users’ information. Among those who own a model of smartphone other than the iPhone, 53% say Apple should unlock the phone, compared with 38% who say they should not.